A few years ago I got athletes foot from a local nail shop. I tried everything to get rid of it, too no avail. I tried spray, creams, and even a pediatrist. The pediatrist charged me over a hundred dollars and after a few months of using a nail cream, I still suffered from the foot fungus. 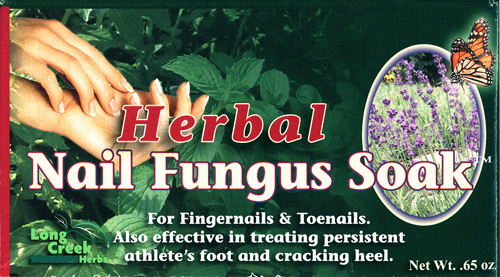 One day I was flipping through my brother's heirloom farming magazine when I noticed an advertisement for an herbal foot fungus soak. I had never heard of such a thing, so I immediately looked up the website online. The soak had some good reviews and I figured for 14.95 plus s/h why not? All I had to do was buy a plastic shoe box ($1.00), and some apple cider vinegar ($2.00) to use with the soak. I boiled the herb in the apple cider vinegar as the direction stated, then let the mixture sit until the next morning. I begin soaking my feet for 5 minutes each, every day, for the next 60 days as directed. After 30 days the fungus and itchy skin was completely gone. The cracking heel was starting to become smoother. By day 60 my feet begin to look like I had gotten a deluxe pedicure. Also after each soak, I started to use a pumice to exfoliated my heels. My feet look absolutely perfect...I can't believe it myself. Sometimes I hold my feet up in the air just to admire it. The mix is no good after 60 days so I poured out what was left and repeated the process. I figure this will only cost me under $100 dollars every year. I actually have begun to love soaking my feet and forcing myself to sit down once a day and relax by soaking my feet. It became like a self imposed "me" time, a lot of times I would soak for 15 -20 minutes just because. My 91 year old grandfather has been soaking his feet almost every night in epson salt for as long as I can remember, and his feet are unusually soft and supple for a 90+ year old man. Recently, a pediatrist commented on how healthy his feet were. The pediatrist seem shock by the health of my grandfather's feet. I don't think I will ever get a pedicure again because I don't have too. I was going just to keep my feet smooth, I have discovered that this isn't necessary. As long as you are doing daily maintenance, your feet will stay smooth. You don't have to spend $30- $80 dollars on a pedicure, you can pay as little as $16 dollars every 60 days and $1.00 a month on a pasteurized apple cider vinegar. Plus, I think that most nail shops are not practicing proper cleaning of tools in between clients as they should. If the tools could be tested we probably would be shocked at the bacteria that was on each tool. Over the years, I have definitely witnessed some questionable practices in the nail shop. I will continue to get my polish changed on my fingers, but even then I bring my own tools and polishes. SO WHAT HOME REMEDIES ARE YOU USING FOR FOOT FUNGUS? IS IT WORKING? Good post, may have to try this out! I'm a wife, mother, daughter, sister and a Mathematician all in that order. I have a deep passion for natural hair. Over the years I've had numerous people ask me how to go natural and get into good shape. After compiling thousands of pictures in an online photo album, I decided to finally put all of my ideas and photos into a blog. I hope this helps someone...be blessed! Enter your email address below to receive my blog in your inbox!